This is not a rattlesnake (Wikimedia Commons). It's that time of year...rattlers are coming out of hibernation. Wherever you are please be watchfull. Listen to your pets, they know when something isn't right. My dog had this one pinned out in our yard this afternoon. She didn't go near it, but new [sic] it wasn't right. 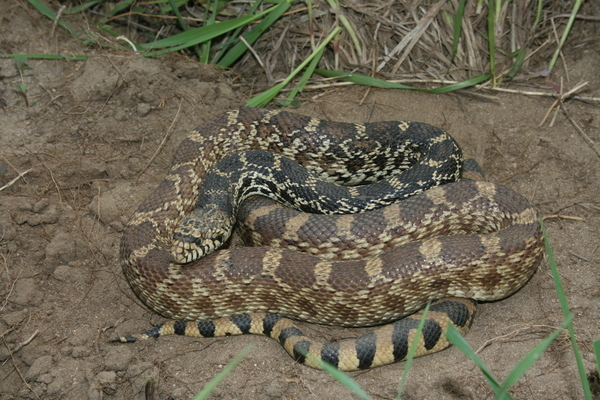 The attached photo was a picture of a bullsnake, non-venomous and not a threat unless you are a mouse. All Rattlesnakes I see gets to meet my 44 mag with snakeshot. I always like to say hi. Thanks for sharing, Dave E.
Oh, boy, don't get me started on snake prejudice, snake mis-identification, and snake stupidity. When I was at F&S I did a blog post on the cretinous behavior macho outdoorsmen exhibit toward snakes (especially venomous snakes) and how ridiculous it was. Chad, I bet you were barbequed by everyone itching to use his .44 Magnum on a snake. At least on this Facebook page, a couple of other people besides myself jumped in to say, "That's a bullsnake, don't kill it."